As Hurricane Michael rapidly approaches western Florida, some of the nation's largest hospital operators are working to mitigate the impact. Investor-owned HCA Healthcare has about 5 percent of its acute-care beds in the path of the storm, according to Evercore ISI. Community Health Systems and Universal Health Services have 4 percent and 1 percent acute-bed in the area, respectively. Lifeguards patrol the beach in advance of Hurricane Michael in Pensacola, Florida, U.S. October 9, 2018. As Hurricane Michael rapidly approaches western Florida as a dangerous Category 4 storm, some of the nation's largest publicly traded hospital operators are working to limit the damage. 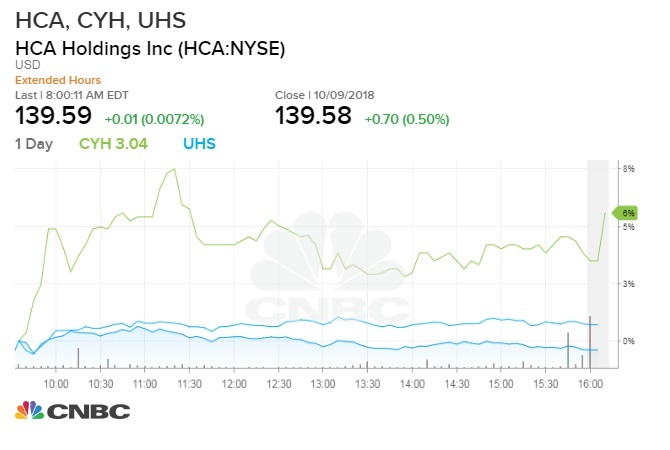 HCA Healthcare, the largest investor-owned hospital operator in the U.S., has about 5 percent of its acute care beds in the path of the storm, according to analysts at Evercore ISI. That's followed by Community Health Systems, which has about 4 percent of its beds in the storm's path, and Universal Health Services with 1 percent. HCA executives are meeting Wednesday morning to discuss the possible impact and preparations. Universal Health Services (UHS) and its facilities are closely monitoring Hurricane Michael. We have three Behavioral Health facilities in the Florida Panhandle region. While we remain fully operational at this time, we are making appropriate preparations for the storm. If evacuation orders are called in the areas in which we have facilities, we will comply with those orders. We will ensure the safety of our clients and staff by relocating operations. During this time, we will post timely updates and necessary instructions on our websites and via social media. When the threat passes and it is safe for clients and staff to return to our facilities, we will continue to post updates regarding the reopening and resumption of normal operations. Shares of HCA and Universal Health Services were marginally higher Wednesday, each up about 0.1 percent midmorning. Community Health Systems shares were up more than 3 percent. Damage from hurricanes Harvey and Irma in Texas, Florida and Louisiana last year showed in the hospitals' quarterly results. The two storms cost HCA an estimated $140 million, before insurance claims, the company said in its 2017 third-quarter earnings report. Community Health Systems said it suffered $40 million in losses due to Harvey and Irma, while Universal Health Services lost about $12 million to $13 million. "At this point the earnings risk from Michael seems significantly lower, though many hospital companies had facilities in the path of Hurricane Florence in September as well," said Evercore ISI analyst Michael Newshel in a research report to clients late Tuesday. Florida Gov. Rick Scott told residents early Wednesday that it was their "last chance" to evacuate before the storm hits the state's Gulf shore. Hurricane Michael was packing winds of up to 140 mph as of Wednesday morning, according to the U.S. National Hurricane Center.